For one reason or another I found myself with some time off work this week. And what would any flapper do with all this free time? 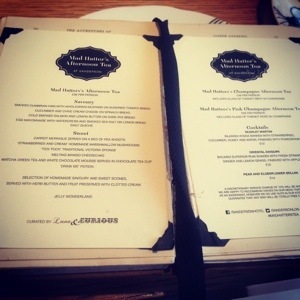 Pop out for afternoon tea of course! 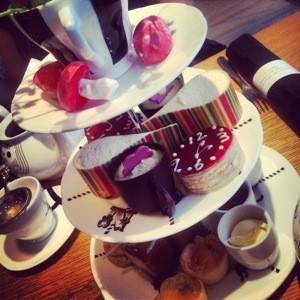 A cheeky email from bookatable.com planted the seed for a long overdue visit to the Sanderson Hotel and their famous Mad Hatter’s Tea Party. So off we went! I had seriously high expectations of this place, as sister hotel St Martin’s Lane is a favourite of mine. And wow! we weren’t disappointed. The outdoor-but-indoor feel is something really special, if only the sun were shining. 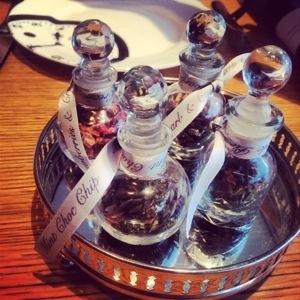 Everything about the tea was magical, from selecting your choice of tea from miniature potion bottle (I had mint choc chip- absolutely delicious! I’d love to know where to get this from!) to plucking the carrot meringues from the jumble of growing pea shoots. My only small, small complaint is that the sandwiches had clearly just come out of the fridge which not only affects the texture of the bread but also the flavour of the filling. I’ve already recommended this to so many people. Can’t wait to go back! Now everyone knows a flapper afternoon out would not be complete without a small amount of dancing (despite being full of sandwiches!) 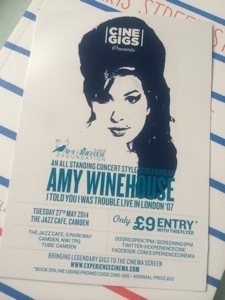 so we headed to Camden’s Jazz Cafe for the Amy Winehouse cine-gig. Devastatingly this is the only way to see Amy these days, but it was emotive and brilliant none the less. The 2007 gig was projected on to a large screen and the mega sound system filled our ears with all the Amy favourites. The various camera angles prevent it from feeling like you’re ‘there’ and the rather stiff ‘we-were-expecting-this-to-be-seated-and-are-accustomed-to-our-personal-space’ audience seemed to frown upon anyone who wanted to throw their arms in the air and sing along at the top of their lungs. I think we did Amy proud though, bless her.